Slacklining in college seems to be the perfect thing to do when you’re not studying for a test or trying to complete a frustrating homework assignment. 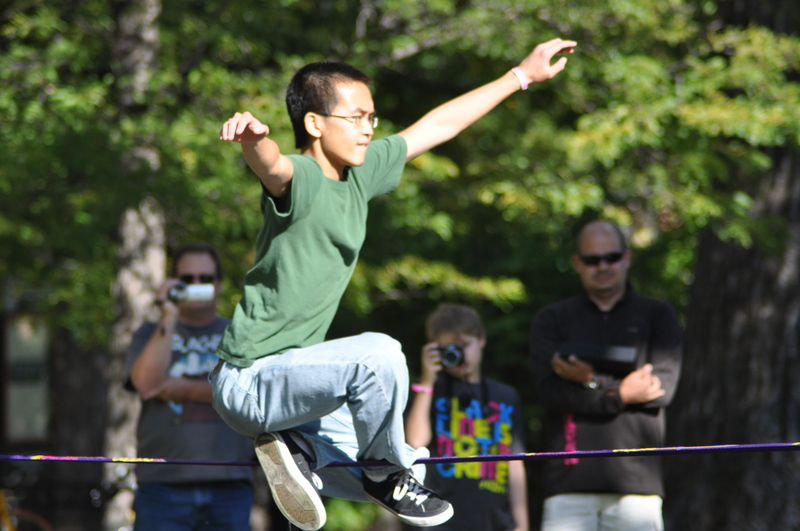 By slacklining one can alleviate that type of stress and anxiety that that environment can bring. 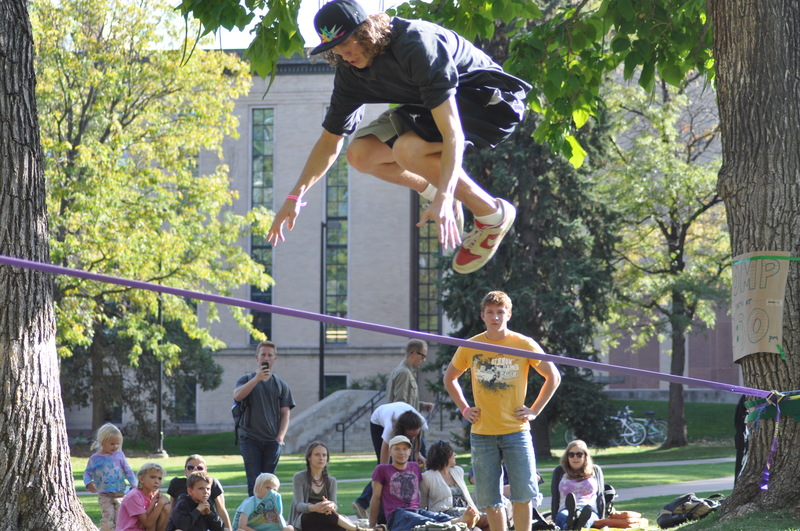 Slackline clubs across the United States have been a popular thing to start amongst the college scene, creating huge turnouts within the student body. Taking it a step further the CU slackline club created a college slackline tournament not only to let the slackers compete for the top spot, but to raise awareness of the sport and to raise money in order to plant trees in the rainforest’s. Travis Brown, Spencer Roberts and Sam Starka are students at CU and are the ones behind this awesome event. Also serving as founders of the CU slackline club, they were there to spread the word and help cultivate the slackline community. Helping to facilitate this event was GIBBON slacklines and Slackline Visions. The GIBBON team brought the protective padding and the lines in order to make this event safe, fun and exciting. GIBBON also provided the winner of the competition a plane ticket to Boston in order to compete in the GIBBON GAME EAST 2011. 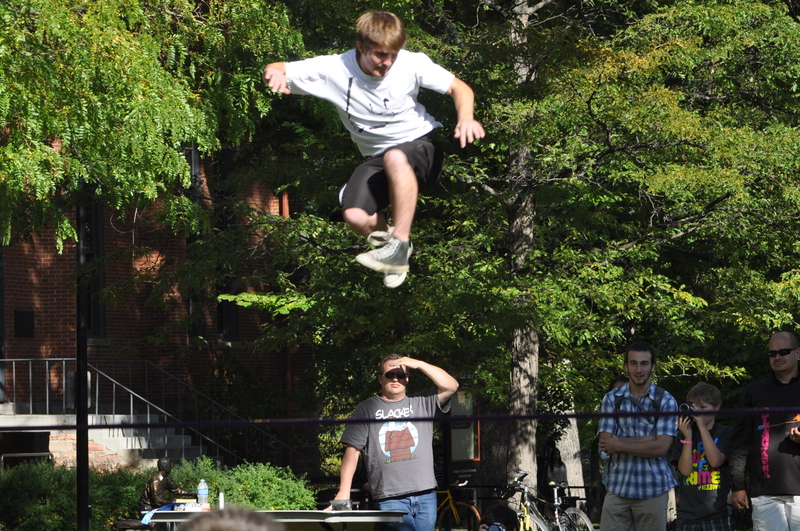 The day for the slackline competition could not have been better, the sun was out with only a few clouds in the sky. A total of 6 lines were set up on campus with a spotter at each one. The lines varied from different kinds of two inch lines to a 70ft one inch Pro Line. After signing a waiver and learning how to save and protect the trees each student received a pink wrist band and they were ready to slack. People were all over campus trying out the different lines, having fun while seeing the many different slackline styles that were present. Since this was a college slackline tournament it only seemed right to invite other slackers from other slackline clubs in Colorado to be a part of this wonderful event. 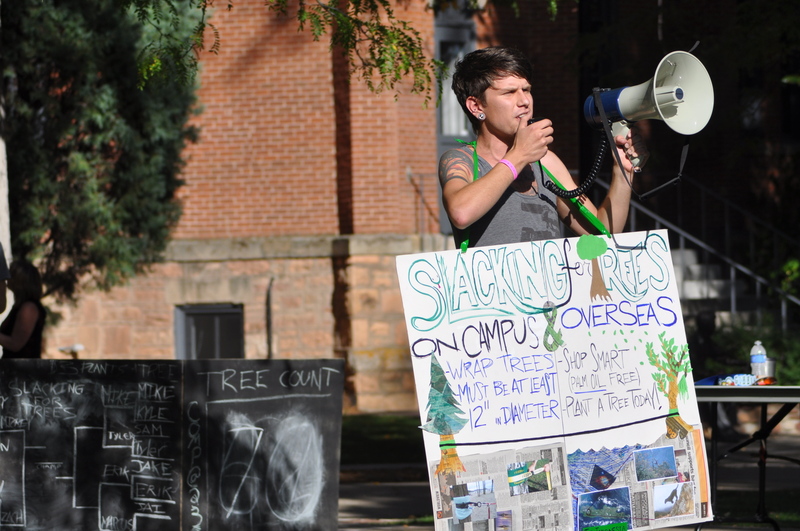 One club that was a major supporter was the Colorado School of Mines slackline club. 15 members all packed into 3 tiny cars, including Mickey Wilson, club president, made their way to the slackline competition. Judging the competition, was the one and only Michael Payton, the stylish Hayden Nickel and myself. There were some very close matches, which made for an exciting event to watch! The energy was high, with different styles and big tricks to go with it. The crowd went crazy when tricks like the chest bounce 360, the back bounce to chest bounce and the backflip to chest bounce were landed. Armed only with a megaphone, Sam Starka did a great job entertaining the crowd during and between the rounds at the event. And since there was a policy that didn’t allow any type of amplified sound, Finn saved the day with his amazing talent on the hand drum. The crowd numbered well over one hundred people supporting their favorite slacker with cheers and encouragement.The final results of the competition were close and definitely gave the judges a run for their money. They were, 4th place Zach, 3rd place Eric, 2nd place Michael Bross and 1st place went to………Mickey Wilson. Congratulations! and good luck in Boston. This was another milestone passed and a great day for the slackline community. Slackline Visions would like to thank Travis, Spencer and Sam for making this event possible. This event truly left people with high energy and a positive mentality about what it is to be a slacker. A special thanks to Kate Denninger for all of the great pictures.